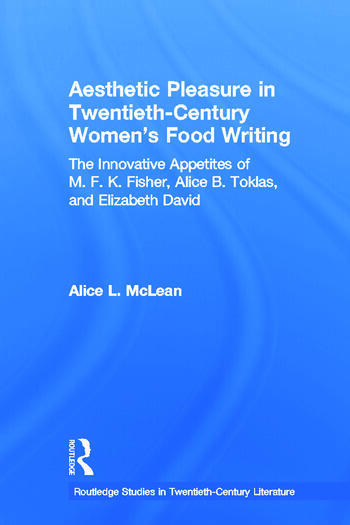 This book explores the aesthetic pleasures of eating and writing in the lives of M. F. K. Fisher (1908-1992), Alice B. Toklas (1877-1967), and Elizabeth David (1913-1992). Growing up during a time when women's food writing was largely limited to the domestic cookbook, which helped to codify the guidelines of middle class domesticity, Fisher, Toklas, and David claimed the pleasures of gastronomy previously reserved for men. Articulating a language through which female desire is artfully and publicly sated, Fisher, Toklas, and David expanded women’s food writing beyond the domestic realm by pioneering forms of self-expression that celebrate female appetite for pleasure and for culinary adventure. In so doing, they illuminate the power of genre-bending food writing to transgress and reconfigure conventional gender ideologies. For these women, food encouraged a sensory engagement with their environment and a physical receptivity toward pleasure that engendered their creative aesthetic. Alice McLean is the author of Cooking in American History (1840-1945). She received her Ph.D. in English from the University of California, Davis, before being awarded an Honors Teaching Fellowship at Sweet Briar College (2005-2009).